Starting a new series of one or two pic posts quickly grabbed at a dining or lunch table of watches worn by friends. 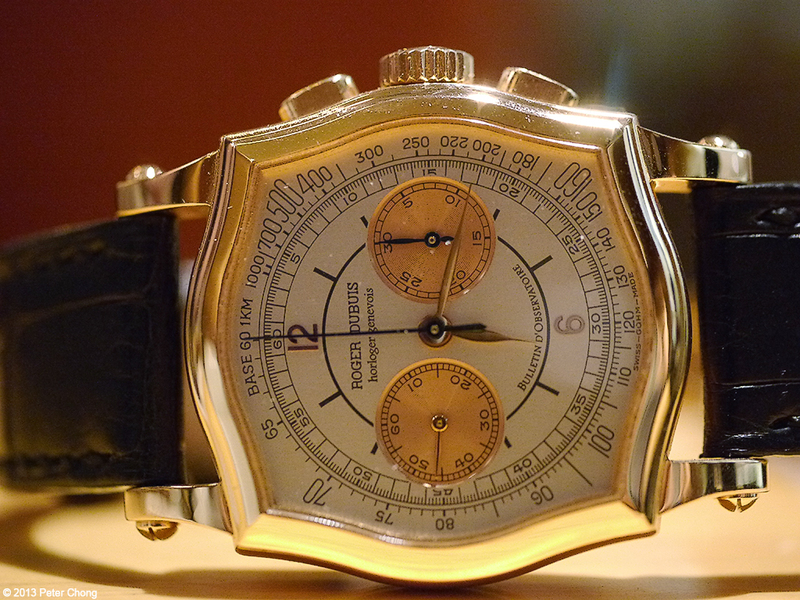 Today is the beautiful, and rather magnificent Roger Dubuis Chronograph Symphatie. Most of these photographs will not have technical quality, but I intend to capture the watches as a snapshot, so beauty is not forgotten. This is the original version, with the beautiful shaped symphatie sapphire glass, unlike later examples where the glass is simplified by making it round. Beautiful. Elegant. Really enjoy reading your blogs (both the food and watches!). Would be great if you could point me to a few brands / models that would be fitting for a 'potential' collector. Thanks! HYT H1: Hydro Mechanical Watch...tres intersting. How are watch dials made?